GE EFS Partners to connect its Flagship Onshore Wind Project in Kipeto, Kenya. GE Renewable Energy and GE Energy Financial Services (GE EFS) have come together to facilitate technology and give debt financing for its flagship onshore wind project in Sub-Sahara Africa. 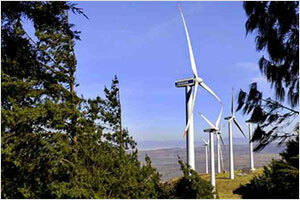 Kipeto Energy Plc 100-megawatt (MW) wind power project is based in south Nairobi, in Kajiado, Kenya. GE Renewable Energy will allocate 60 of its highly efficient GE 1.7-103 turbines and a 17km (220KV) transmission line to hold the power to Isinya substation in Kajiado County, providing power to the equivalent of approximately 40,000 houses in the region. The 100MW Kipeto wind power project will provide clean energy to the national grid as a significant contribution to Kenya’s aim 2030 and Big Four Agenda. The project is expected to reach profitable operation in 2020. The Kipeto wind power project, which reached financial close last month, is financed by equity from Actis and a Kenyan company, Craftskills Wind Energy International, alongside senior debt from the Overseas Private Investment Corporation (OPIC), the United States government’s development finance institution (DFI). GE EFS provided relavant support which facilitated OPIC’s financing and will help to enable Kipeto to begin construction of the second largest wind farm in Kenya with GE wind turbines. GE Renewable Energy will also provide operations and maintenance services for the project. It is anticipated that more than 400 job opportunities will be created during the construction phase of the project and an additional 70 permanent jobs during the operational phase. The Kipeto project was initially started by Craftskills Wind Energy International, with the help from GE. AIIM and IFC InfraVentures combinely developed the project with Craftskills from 2014 until early 2018, getting into an action a 20-year Power Purchase Agreement (PPA) with Kenya Power and Lighting in 2016. Kipeto Energy Plc has rented 70 square km of land in the Esilanke area of Kajiado county including reaching agreement for the relocating local families. The local communities like massai will also receive 5% of annual dividend payouts once the plant opens in 2020.